The word ‘miann’ is Gaelic for ‘the ardent desire to know God.’ Ardent is the operative word in Fleur Darkin’s new work for Scottish Dance Theatre not only in terms of the choreography but in the music of The One Ensemble who play live on stage. Miann is also a spiritual work that battles with death and separation not in philosophical terms but in a visceral, personal confrontation that commemorates Darkin’s stepfather. Darkin’s description of the work is every bit as passionate as her choreography: ‘I wanted to create a space that we could share. I wanted the music of The One Ensemble to ring out like a thunderstorm shaking our bodies. I wanted the dancers to remind us that life is felt before it is thought about. I wanted us to taste the fresh water, breathe in forest air and feel the willow under our bare feet. I wanted to prove that feelings are real. I wanted a space where the invisible might be felt. I wanted a space to honour my parent…I wanted to create a gift out of dance.’ Seeing Miann is to embrace these words in physical form. With no curtain at the Queen Elizabeth Hall we have plenty of time to contemplate the set. Designed by Alexander Ruth and lit by Emma Jones, it looks as if it was conceived for in-the-round performance: a circle of white floor in the middle of which is what looks like a sundial or a sail on its mast. All around the white circle are bundles of dry branches and beyond them towards the back are the spaces for the four musicians and their instruments. On either side at the front of the stage are two urns of flowers that Audrey Rogero and Naomi Murray pick up and hold like living statues at the entrance to a cemetery. The smoke that issues from the urns is probably dry ice that looks like incense for there is no fragrance. I suspect Darkin’s original idea of immersing our olfactory senses in the production has been compromised by health and safety (another administrative incursion into the production is that after Rogero and Murray circulate with their urns through the audience and return backstage the QEH reminds us to turn off our mobile phones). In her program note, Darkin references the Callanish stone circle on Lewis, a landscape in which she ‘wanted us all to get lost…with no story, no orientation points, only beckoning paths.’ When Amy Hollinshead first appears on stage she has muddied limbs and hands as if she has been running and slipping among the stones on a wet day; she carries with her the evidence of the wild countryside but it is not embodied in Ruth’s clean and dry construction; I keep wishing for a simple stage of turf or peat. Hollinshead sets the physical tone of the choreography in jumping frenziedly, repeatedly, exhaustively to the sound of her exertion. It is a motif that will return poignantly at the end suffused with uncontrolled grief and anger. On this occasion it is the anticipation of Francesco Ferrari’s arrival — the loved one — who wraps her, after some trepidation on her part and some coaxing on his, in his long cloak (Ruth’s costumes, as one might expect from a fashion designer, excel here). The other dancers enter as different manifestations of filial grief: a stoic Quang Kien Van in a dance with ritual overtones, a tentative or agnostic Matthew Robinson and a maternal Aya Steigman carrying her child (Murray) clasped to her front. The ensuing mêlée of dancers running, rolling and hurling themselves to the floor is like a wild mating game of sensual, brutal proportions. But this is not narrative; this is raw, primal emotion expressed in familiar human patterns; the message is in the rawness not the patterns. Steigman and Murray work like demons to rip up part of the floor to reveal turf: a funeral plot before the grave is dug. Artur Grabarczyk dances a powerful, erotically charged duet with Murray while Steigman remains motionless on the grave and the other dancers make their reptilian way around the branches like the circular path of life. When Ferrari has completed his circle, Murray brings in a crown of flowers with which she finally crowns him like a chosen one. He watches Hollinshead don a black mourning shroud and the sundial/sail element becomes a metaphor for the river Styx that the Greeks represented as the division between life and death. As Ferrari passes through to the other side, Hollinshead tries to follow. Her final outburst and the communal response is an apotheosis in dance and music of heroic proportions. The depth of Darkin’s emotion is clearly a powerful creative force. Her physical movement phrases have the authenticity of grief and anger and she has harnessed the force of the music to amplify them. 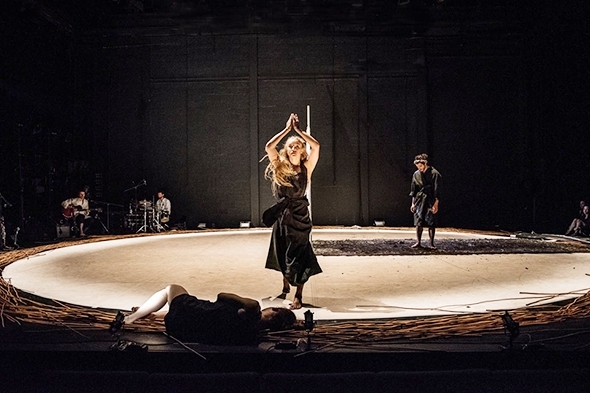 She seems to drag her dancers into the ring and they give themselves fully to this production, a quality in Scottish Dance Theatre that is impressive. When I first saw them it was at the very beginning of Darkin’s appointment in a double bill of Jo Strømgren’s Winter, Again and Victor Quijada’s Second Coming; it was a wonderful cast but one of the difficulties with a change in artistic direction is a possible (some may say inevitable) shakeup in dancers. I hope Darkin can keep the present dancers together; they are well worth watching. In a performance like Miann there are enormous benefits when the dancers are used to each other, open to each other and familiar with the way they each move.